Plantar Fasciitis as a generalised term is the most common cause of heel pain and discomfort to the sole of your foot. It is a very common problem, affecting 1 in 10 of us at some time and if you are female you are unfortunately twice as likely to suffer. It can affect people of all ages but is more common in the over 40’s. What is the Plantar Fascia? The plantar fascia is a very tough yet flexible band of connective tissue that runs along the sole of your foot. It attaches to your heel bone and runs along the underside of your foot to connect to the bones of the middle part of your foot. This fascia acts like a shock absorbing suspension for your feet helping to distribute loads of weight bearing across all of the foot. When the plantar fascia becomes damaged it is commonly referred to as Plantar Fasciitis. Plantar fasciitis technically suggests inflammation of the plantar fascia tissue is present but some studies indicate that inflammation is not always present, it is more a degenerative change to the plantar fascia, and therefore should more accurately be referred to as Plantar Fasciosis. Whatever, the terminology the symptoms remain the same. Pain, often sharp, to the heel and arch of your foot which is worse and most intense when first standing up or walking particularly after a period of sitting or on first getting out of bed. You will typically feel the intensity of the pain becomes a little less as you continue to walk. What causes plantar fasciitis and plantar fasciosis? Footwear: A change of footwear particularly to an unsupported type footwear such as a flat sandal or flip flop which offer no or very limited support to the arch of your foot can often be the onset of a strain to the fascia leading to inflammation or damage. Running: A rapid increase or change in your running regime can cause a strain to your plantar fascia. This is even more likely to occur if your running shoes are old and no longer offer the support required. Weight: An increase in weight, particularly in those that do not exercise regularly, is often associated with the onset of PF. Idiopathic: Sometimes there appears to be no known cause and this might be because the condition has been caused by repetitive micro events to the plantar fascia that have culminated in the onset of the problem. For example using the soles of your feet to stand on the rungs of a ladder whilst cleaning the windows may not have been painful at the time but may have strained and inflamed the sole of your foot and caused the plantar fasciitis. However, there are many self help measures you can take to help ease this condition. Stretch your calf muscles. Tight calf muscles can interfere with the recovery. Avoid flat un-supporting footwear. Instead choose shoes with a good arch support. Gentle massage of the plantar fascia can help reduce tension and associated pain. Biofreeze gel is ideal. The use of ice can help control the pain. Take care when applying ice. Read the Pain Guru’s blog on ICE for more information. 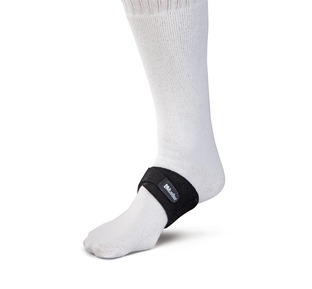 Use a specially designed support or insole designed to help support the affected heel and arch. Plantar fasciitis and fasciosis are not the only causes of foot and heel pain. Always seek the diagnosis of a qualified medical practitioner. 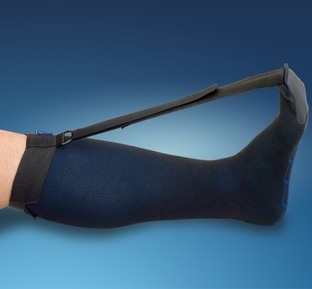 "Our high tech compression sock is a perfect adjunct to a doctor/therapist regime of treatment"
Ideal for: Plantar fasciitis, heel pain and heel spur. "High quality comfortable night sock with anti-slip feature for those night-time bathroom visits"
Ideal for: Plantar fasciitis, heel spur and rehabilitation of the plantar fascia. 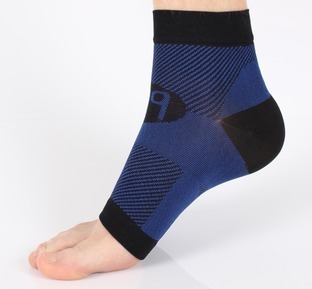 "A simple, comfortable, lightweight, easy to use and effective support that eases arch pain and plantar fasciitis"
Ideal for: Plantar fasciitis and supporting the natural arch of the foot.